ACELEPRYN insecticide is a suspension concentrate with unmatched season long control with a single application. Provides control of grub species, caterpillars (cutworm) and annual bluegrass weevils. Arena 50 WDG insecticide is a broad spectrum insecticide for control of a wide spectrum of insects infesting turfgrass and provides excellent and long residual insect control. DELTAGARD is a highly effective, fast acting contact insecticide to control chinch bug, cutworm, ants, sodweb worm and ticks in turf. Powerful micro-encapsulation technology for long-lasting insect control. Demand CS insecticide with iCAP technology is an advanced generation, proven product with a unique and proprietary microencapsulated formulation that offers outstanding residual control of a broad range of crawling and flying insects. MERIT has fast become the standard proven insecticide for grub control on a wide range of turf surfaces. Ready-to-use granular. MERIT has fast become the standard proven insecticide for grub control on a wide range of turf surfaces. Solupak formulation; 75% wettable powder in a soluble bag. PYRATE 480 EC is a highly effective insecticide for the control of turf pests such as ants, chinch bugs, cutworm, leatherjackets, sod webworms and turfgrass weevils on golf courses, highway medians, industrial sites and sod farms. SEVIN T&O provides excellent control of surface feeding insects. It is an outstanding curative insect control material, has a short soil residual, and a favourable applicator and environmental record. 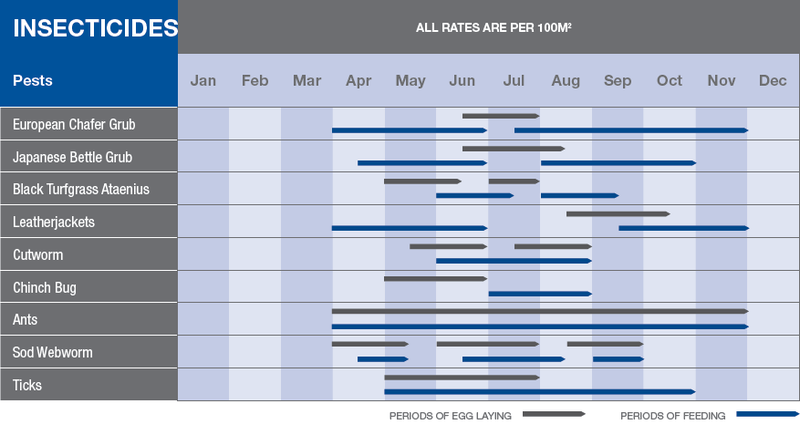 Click here for insecticide application rates and appropriate usage guidelines.